Because of technology, people are rapidly becoming a surplus resource. There is a significant paradox present in our scientific advancement; increases in technology both allow for larger populations and at the same time reduce the actual need for people. It is a twist on Jervon's Paradox, where he states that increases in resource efficiency actually increase consumption of those resources, rather than reduce it as would be expected. Ultimately, this paradoxical outcome will render vast populations completely unnecessary for the world to function, which will lead to an unimagined economic crisis. And the worst part of this is, the transformation is already underway. While economists debate and politicians bicker about whether our economic downturn is the result of debt and deficit or lack of stimulus and government stabilization, none of them are addressing a real issue in this bad economy, which is the movement to replace people with technology. They talk about outsourcing, which is a real problem in America, but never discuss robotization. And yes, that is a real word, you just never hear it, because no one talks about it. Robotic replacement began with the auto industry in the 70's and 80's, and for a while, the issue entered national consciousness. "Terminator" and "Making Mister Right" are two examples of movies from that period that examined the fear that people were replicable with robots. Modern movies don't even discuss this, and in fact pointedly make the counter argument, humans will always be necessary. This is what is put forth by the Matrix, which, even though humans are completely enslaved by their mechanics (cell phones and iPad's) their human energy will always be necessary for the technological beings to survive. Other movies, like "I, Robot" and "A.I." go even further by assuring us that the thing that the mechanical beings desire more than anything is to be human, with human emotions and human ideals. The message of all of these modern movies that examine our unease with the future of technology is that no matter what, we will always be superior to our devices. Of the modern era speculative fiction, the only one to continue to present the uselessness of organics is "Dr. Who" with the Cybermen. They are called "Human 2.0" and are constantly trying to upgrade us to become robots, because organic beings are not efficient in a high tech world. That said, our technology still has the real potential to devastate our modern society. Robots do not need self will or a malevolent agenda to eliminate us, we can become simple collateral damage. 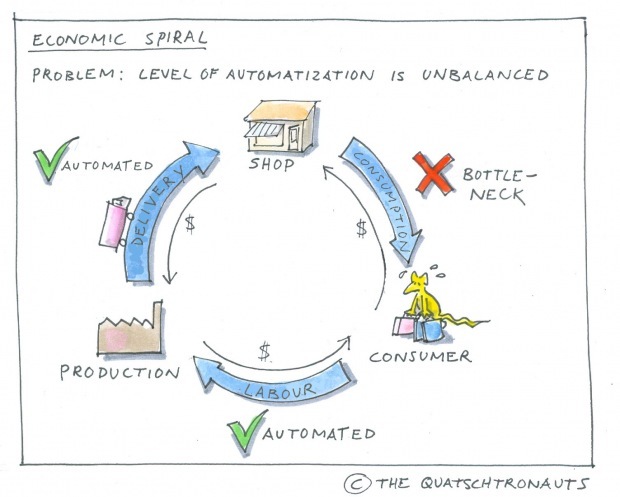 Even worse, we already are and in industries far beyond the manufacturing world.I blogged about this before, envisioning an economy based on the service industry, but in reality, that is the next frontier under attack by automation. Most grocery stores now have self checkout lanes that allow you to use a scanning robot to purchase your food. This has expanded to many stores, including Home Depot and Ikea, where the quick and efficient way to get out of the store is to use a robotic checker, rather than a human one. J.C. Penny's has upped the stakes in this by phasing out the checkout cashier entirely. Based on the Apple Store model, to purchase goods at Penny's you go to a scanning station located in each department, scan your merchandise and move on. If a cash register even exists in the store, it will only be for purchases that are too large and complex to be accommodated by the stations. The result of all of this, fewer employees. Where the grocery store might have employed 15 cashiers at peak hours, now they only have four or five, with another one managing a pod of 10 robots. The department store, freed from having to have many manned registers, can survive with a few floor walkers, to assist customers. The store's overhead drops dramatically, and as a result, prices drop marginally. Most of the profit from the workforce reduction goes into the pockets of the company, but they can cut prices enough that most people don't complain about the impersonal robot with the artificially friendly voice that has replaced their favorite checker. Worse, it is even sold to them as a convenience. Receptionists are a thing of the past. Where most large companies had several switchboard operators, and each department had a person who primarily answered phones, in addition to the traditional secretary, now there is a voice system telling you to dial your extension now. In the world of "Mad Men," the Receptionist was the public face of the company. Further, technology allows one person to do the job of many. Rather than speak to a customer service representative, which even if they are in India, is a human, some companies, like Microsoft require you to e-mail them a description of your problem and wait for a response, which is a problem if your only computer is not working and you can't get to e-mail. But by using this system, a single tech consultant can respond to many more people than could be handled when actual conversation was required. This problem has even spread to realms beyond public view or comment. A good example of this is the architectural profession. Fifty years ago, a large architecture firm like S.O.M. would have employed a literal army of drafters, many of whom would have sat, day after day producing the same window detail over and over for a skyscraper. With the introduction of AutoCAD, that detail became a block that could be replicated at will in a few seconds, or minutes at most if notes needed changing. This dramatically cut the need for staff and also reduced the billable rate on the idea, "We'll make it up on volume." But when the volume fell, those hordes of drafters became a luxury rather than a necessity, and they were gone. Skip forward to the Revit era, and there is even less need for a large staff, even in a big firm. Parametrics allow you to create many drawings simultaneously, and as a result, you need fewer people on each project than in the AutoCAD era. And on the construction end, the Stone Spray Project is trying to perfect 3-D printing as a construction method. If they are successful, we will no longer need people to lay concrete or frame buildings, we will be like "The Jetsons" where buildings are just extruded from a huge machine brought to the jobsite. And this trend will only continue, because no country, no matter how cheap the wages, can ever hope to compete with a robotic workforce that never needs to sleep, and only eats a few dollars worth of electricity. Even if the robot breaks down frequently and requires repairs, it isn't any worse than an employer sponsored medical plan. The laws of economics demand that in the end, every job that can be mechanized will be. Remember, corporations have no obligations to society, their only obligation is to make money for their shareholders. To not maximize profits can actually be considered a crime, because it is viewed as a form of negligence. Taken to it's logical conclusion, in the future, barring laws against replacing people with robots, jobs for actual humans will be few and far between, and will likely only exist in the artistic and intellectual professions. And now for the other side of the impending disaster, technology will continue to increase the carrying capacity of the Earth. This, of course does not take Global Warming into account, which certainly can change the equation entirely. But even considering the impacts of climate change, technology is doing a good job of allowing more and more people to exist on this planet. GenMod foods allow larger crop yields, even in very bad growing conditions. Medicines and vaccines slow or halt the spread of disease. Pesticides and extermination remove the competition and disease vectors of vermin. Cities pack more and more people into smaller and smaller areas to the point where Egypt, the most densely populated region in the world, packs 65 million people into a strip of land that averages 4 miles wide and is 400 miles long. Even Tokyo or Mexico City hasn't achieved this feat. Even though population growth is slowing, and even reversing in some areas, we still have more people alive on this planet right now than have ever lived, and that is a result of your technological and scientific advances. The more we push the frontiers, the more people we can pack onto the planet. And the question is, what will they do for a living? As technology increases the population, it decreases the need for having people. So in the end, you will have a large population who have nothing to do, because technology does it all for them. This leads to two potential scenarios for our future, one wildly optimistic and one that is bleak but based in reality. The optimistic view is that of "Star Trek" where money doesn't exist, people don't have jobs, but instead live lives of the new age philosophy of "Following your Bliss." In other words, people occupy their time by doing things that fulfill them. Because there is no actual need to work, they invent things to do with their lives. In a world of replicator technology, every physical need can be taken care of with a simple command to the machine that fulfills it. This would require a massive restructuring of society, economics and ethics. It would require the measure of a person to be based in something other than wealth or positional goods. In all reality, it would require embracing Karl Marx's ideals of the egalitarian society. And I want to note here, the Soviet Union was never modeled after Marx; don't conflate Marxism with Stalinist Communism, they are very different animals. The pessimistic view, which given human nature is very realistic, basically will mandate vast expansion of Welfare. And by vast expansion, I mean that maybe as much as three quarters of our society will have to live their entire lives on the Dole. It will not be because they are lazy and want to, it will be because, simply, there are almost no jobs that don't require either intellect or artistry. And if we can program aesthetics into the mix, even those jobs could be at risk, but right now I don't see that at least. But for the rest of society, what will they do? Cleaning robots, checkout robots, automated assembly lines, mechanized surgeries, self-driving cars and the hundreds of other technological innovations will eliminate most skilled and unskilled labor. As a result, unless we adopt a policy of actual or de facto euthanasia, we will have billions of people with literally nothing to do to earn money. If we are not willing to watch them starve to death in the streets, de facto euthanasia, we will have to take care of them body and soul for their entire lives, which due to medical advances, could last for a century or more. This is a hell right out of an Ayn Rand novel, where the intellectual class is literally sucked dry from taxes in order to support a multitude of people who will never work a day in their lives. Of course, Rand would be more than willing to let them all die, a cruelty that I doubt most people would share in. At least I hope not. But that said, the reality of automation, taken to it's logical conclusion really dictates this sort of future. If you doubt it, look at Detroit, Flint and the other cities of the Rust Belt. They were not devastated by a failing auto industry; that came later. What broke those cities was that people stopped being necessary, at least not in the numbers they were before. And the result is places where the actual unemployment rate is over 50%, and it will likely remain that way until the cities finally are abandoned and cease to exist. This is already happening with Detroit, as block after block is being demolished and the streets ripped out. So ultimately, we have three paths before us: reject automation, and require people to do the work, even if it is more profitable and efficient to have robots do it; accept that the majority of people in the world will be permanently unemployed and have to be cared for with government programs; or change our paradigm of the measure of man to value each person following their own path, no matter how strange, while simultaneously becoming a truly egalitarian society. I, personally, vote for the last option. It is the only human choice.